Born in thiruveLLarai, he was named srI vishNu chiththar by his parents. He became a sishya of emperumAnAr and learns bhagavath vishayam and srIbhAshyam from thirukkurugaippirAn piLLAn. It is said that, he was honoured by emperumAnAr himself with the title engaLAzhwAn (since he was resembling kUrathAzhwAn in his gyAnam, bhakthi, AchArya nishtai, etc). nadAthUr ammAL (vAthsya varadhAchAryar) is one of his prime sishyas and is the grandson of nadAthUr AzhwAn (who is also a sishya of emperumAnAr). When ammAL wanted to learn srIbhAshyam from his grandfather, his grandfather due to his old age, asks ammAL to go to engaLAzhwAn and learn the same. ammAL goes to engaLAzhwAn’s thirumALigai (home) and knocks on the door. engaLAzhwAn asks “Who is that?” and ammAL replies “I am varadhan”. engaLAzhwAn says “Come back after the ‘I’ dies”. ammAL returns to his home and enquires from his grandfather about the incident. nadhAthUr AzhwAn says we must always introduce ourselves as “adiyEn” (dhAsan) with total humility and never use the terms “I”, “I am”, etc., which are the cause of ahankAram (ego). Understanding the principle, ammAL returns to engaLAzhwAn and knocks at the door. This time when engaLAzhwAn asks who is at the door, ammAL replies “adiyEn varadhan is here”. Being pleased, engaLAzhwAn welcomes ammAL, accepts him as his sishya and teaches him all the valuable principles. engaLAzhwAn also becomes to be known as ammAL AchAryan, since he became the AchAryan of nadAthUr ammAL who becomes to be a great scholar. emperumAnAr during his final days, instructs engaLAzhwAn to take shelter of thirukkurugaippirAn piLLAn. In our vyAkyAnams, a few idhihyams (incidents) that show the glories of engaLAzhwAn are seen. Let us see some of them now. periyAzhwAr thirumozhi 2.9.10 – thiruvAimozhi piLLai vyAkyAnam – In this pAsuram periyAzhwAr reveals kaNNan emperumAn‘s great liking for nAval (rose apple) fruit. In this connection, an incident relating engaLAzhwAn and nanjIyar is revealed. engaLAzhwAn has a dream before going to sleep (in semi-awake state). In that dream, a small boy appears in the dream and asks engaLAzhwAn to give him some nAval fruit. When engaLAzhwAn asks who the boy is, the boy replies “I am Ayar thEvu – son of nanjIyar” (Ayar thEvu is the name of the thiruvArAdhana deity of nanjIyar). engaLAzhwAn goes to nanjIyar and informs him that his thiruvArAdhana perumAL is not letting him sleep. nanjIyar then goes to his thiruvArAdhanam room and asks his emperumAn not to disturb him. mudhal thiruvanthAdhi 44 – nampiLLai/periyavAchAn piLLai vyAkyAnams – In this pAsuram, poigaiyAzhwAr establishes that emperumAn will accept the names and forms which are dear to his devotees. The same incident (identified in the previous point) is explained here. The context here is slightly different – when emperumAn introduced himself to engaLAzhwAn he used the name that was given to him by nanjIyar (that is Ayar thEvu). Hearing this incident from engaLAzhwAn, nanjIyar becomes ecstatic that emperumAn introduces himself using the name that was given by him. pala gyAnam (knowledge about the goal) – To carry out all instructions of bhAgavathas without any hesitation. 118 – engaLAzhwAn was explaining charama slOkam to nadAthUrammAL. When explaining “sarva dharmAn parithyajya” – nadAthUr ammAL wonders why is emperumAn talking with so much svAthanthriyam in disregarding all dharmams (upAyams) that are explained in sAsthram. engaLAzhwAn replies that it is the true nature of bhagavAn – he is fully independent – so it is fitting for him to say that. Moreover, he says, emperumAn is relieving the jIvAthmA from indulging in other upAyams which are against the true nature of jIvAthmA – since the jIvAthmA is fully dependent on bhagavAn it is fitting for the jIvAthmA to accept bhagavAn as upAyam. So, engaLAzhwAn categorically explains that bhagavAn’s words here are most apt. 153 – In this engaLAzhwAn beautifully brings out the qualities of an AchAryan. AchAryan means one who has given up the bodily concept of the soul, understood that he is fully subservient to emperumAn, given up any attachment to other dhEvathas, understands that emperumAn is present everywhere (omnipresent), spends his whole time in this world focussing on archAvathAra emperumAn and finally reaches the divine abode of paramapadham. Others will claim themselves to be the leader of the whole universe, depend on their sishyas in collecting wealth and serving them. 174 – When pinbhazhagarAm perumAL jIyar (who is a dear sishya of nampiLLai) was ill, he asks other srIvaishNavas to pray to emperumAn for his speedy recovery – now, this is considered as improper per srIvaishNava etiquette – one should not pray to emperumAn for anything – even for recovering from illness (what to speak about going to doctor, etc). Seeing this, sishyas of nampiLLai come and enquire from nampiLLai on why jIyar was doing that. nampiLLai asks his sishyas to enquire from few swamys about jIyar’s behaviour. nampiLLai first says, go and ask engaLAzhwAn who is an expert in all sAsthram. engaLAzhwAn replies “may be he is attached to srIrangam and he wants to stay here for some more time”. 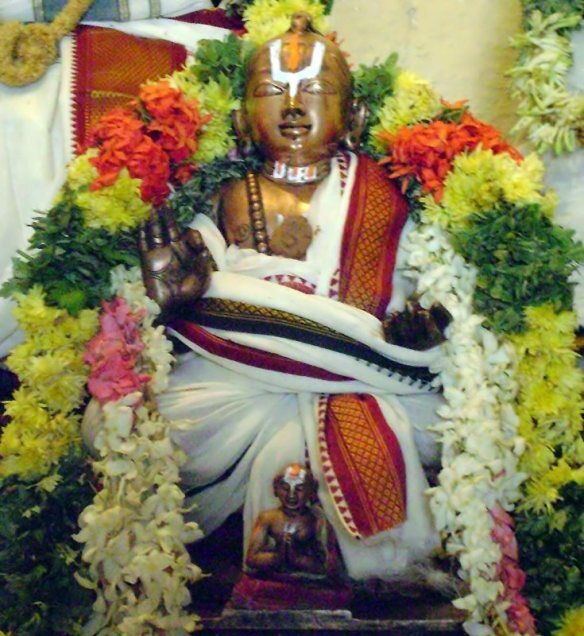 nampiLLai then asks his sishyas to go and ask thirunArAyaNapurathu arayar – arayar says “may be he has some unfinished tasks which he wants to complete, so he is praying to prolonging his life here”. nampiLLai then asks his sishyas to ammangi ammAL who says “who would want to leave nampiLLai’s kAlakshEpa gOshti, he may be praying so he is here for some more time to listen to nampiLLai’s kAlakshEpam”. nampiLLai then asks his sishyas to go to periya mudhaliyAr and he says “may be he is too attached to namperumAL that he does not want to leave from here”. nampiLLai finally asks jIyar himself if any of these views are in line with what he himself is thinking. jIyar replies “No. You know everything. But out of your mercy, you want to reveal this by me. Let me say why I want to continue living here. Everyday, after you taking bath, I get to have the divine dharshan of your form and serve you by fanning, etc. How can I give up that service and go to parampadham just yet?”. Thus, pinbhazhagarAm perumAL jIyar reveals the highest principle for a sishya – to be fully attached to the divine form of ones own AchAryan. Hearing this everyone was amazed by jIyar’s devotion towards nampiLLai. This principle is explained by piLLai lOkAchAryar in srIvachana bhUshaNa dhivya sAsthram (sUthram 333) and maNavALa mAmunigaL in his upadhEsa rathina mAlai as well (pAsurams 65 and 66). Thus, we have seen some glimpses of the glorious life of engaLAzhwAn. He was fully situated in bhAgavatha nishtai and was very dear to emperumAnAr himself. Let us pray at his lotus feet that we too get a little bit of such bhAgavatha nishtai. This entry was posted in other AchAryas on April 4, 2013 by sarathyt. Awesome post once again Sarathy swami!